This may be a bull thistle, found along the sewer right of way at Mountain Lakes. Bull thistles are not native, but the seed head is quite a sight. Close up, the seeds look as if they're auditioning for the role of the forest spirits in the movie Avatar. This hardwon image might rightly be entitled: "Portrait of a Forest While Being Stung By a Bee". It's poignantly called "Ouch!!" for short. Few have dared to try this innovative, impressionistic approach to nature photography. Fortunately, the camera landed on leaf litter rather than a rock. Identification of the bee down to species level was made more difficult by its capacity for remaining unseen. Yesterday, with Hurricane Irene headed our way, I stopped by the Princeton High School to check on preparations for the coming deluge. This part of the school had stormwater seep under the doors a week ago, and was most emphatically flooded two years prior when Hurricane Bill paid a visit. I've heard from several sources that the bill for Hurricane Bill included a new stage floor for the high school's performing arts center, which had become warped by flooding damage. Even if insurance paid for the replacement, one has to wonder if the district school's insurance rates took a jump afterwards. Here's how the flooding happens: The retention basin in the photo (a.k.a. 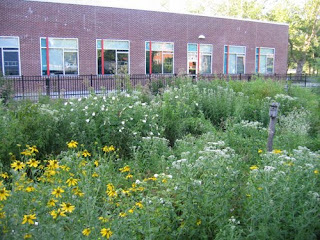 "ecolab", which we have planted with native wetland species), is surrounded on three sides by the high school and receives runoff from the high school roofs and also from nearby parking lots. The basin in turn drains into the system of stormwater pipes underneath Walnut Street. 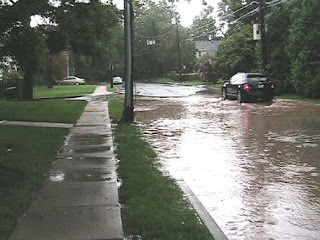 If it rains long enough and hard enough, however, the street's underground stormdrain system becomes filled to the brim, water has nowhere to go, and the basin overflows. At that point, pipes no longer matter and surface flow dictates where floodwater goes. Since water flows downhill, the only way to get rid of the water is for it to flow out to Walnut Street and safely away from the building. Unfortunately, Walnut Street is higher than the high school doorway thresholds. In these heavy rains, Walnut Street floods and becomes a river, and stormwater actually flows towards the high school rather than away. Exasperated school staff were trying to pump water out of the school. The custodians had just finished prepping all the floors for the return of students, and now they would have to do it all over again. The cafeteria had flooded, and it looked like utility rooms in the basement were now under water. One staff member tried to blame the vegetation in the retention basin, but all around him was evidence that the vegetation had played no role in the flooding whatsoever. The drain, photographed this morning, showed no signs of blockage, which is no surprise given that, when the street storm drains become overwhelmed, the water reverses flow and heads in to the retention basin from the street, rather than out. At 1am this morning, this whole area was a lake. A curb cut meant to carry surface water away from the retention basin was instead carrying water towards it. The only solution I see is to lower the curb on the other side of Walnut Street so that the mighty Walnut Street River can flow into the field owned by Westminster Conservatory. This, in fact, is what some water was doing last night, but to an insufficient extent. A pond formed in this field last night, next to the Westminster parking lot. Last year, the field was declared by Westminster's own consultants to be a wetland that could not be developed. Since the conservatory uses the highschool performing arts center for some of its performances, utilizing this field more effectively to prevent flooding of the high school seems to be a solution that would benefit all involved. What needs to be made clear to decision-makers is that the native plantings in the retention basin have no impact on flooding, lest this ecologically vibrant and educational planting become the victim of an invasion of red herring. Most of these photos are from a post two years ago after Hurricane Bill paid a visit to Princeton. Hurricane Irene, because it passed through 'round midnight last night, was less photogenic, but the impact of the torrential rains was the same. The underground pipes designed to carry away stormwater get overwhelmed, the streets become rivers, and the flow of the water becomes dictated by the lay of the land (and streets). In my part of town, these massive downpours cause water to flow from the high school and Westminster Conservatory onto Franklin Street. It then takes a right down Ewing before making an unfortunate left turn into the apartment parking lot. quickly overwhelms the stormdrain, then heads under the fence into people's backyards. This is not good. 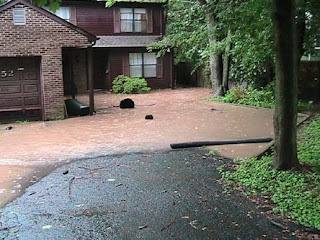 The water came within one inch of the neighbor's threshold. After flowing diagonally across the block through backyards and around foundations, it emerges across the street from me, spilling over the curb at Ewing and Harrison Street on its way down to the intersection with Hamilton, where it serves as a traffic calming device. Back at the point where things go wrong on Ewing Street, this unfortunate foray of stormwater runoff into people's backyards could be avoided if the entryway to the apartment parking lot off Ewing Street was raised slightly so that the surface water would continue down Ewing rather than flow into the parking lot. I proposed this solution to the borough engineer two years ago, to no avail. Reportedly, the borough has no control of the matter, and the apartment complex is within its rights to (unintentionally) "harvest" stormwater from a public street and divert it into the yards of neighbors. All this seems strange. Since the needed modification is within the boundaries of the borough's street right of way (the street right of way actually includes the sidewalks), the borough would seem within its rights to intervene. In the meantime, history continues to repeat itself. The latest white pine fatality in the neighborhood is at the edge of my backyard and Potts Park. Across the street from my house is a dead spruce. The township arborist believes that the drought last summer, plus another drought this year in late June and July, may have stressed some of the local white pines and spruces beyond their limits. Another arborist tells me that the herbicide Imprelis, mentioned in a previous post as a possible culprit, would only affect the more manicured areas where herbicides are more likely to be used. Spruce and white pine have been dying in many unmanicured areas, and he sees climate shift as a likely cause. White pines and spruce were introduced to Princeton from their more natural range to the north, suggesting they'd be the first to show stress from increasing heat and drought. Though all urban trees eventually have to be removed, typically at a cost of $1000 or more, one can speculate that the weather extremes associated with climate change are making those costs come due earlier than they would otherwise. This particular tree had a scar that surely didn't help. Say you love to whitewater canoe, and want your kids to experience the same joys of running rapids that you remember from childhood. But you live in New Jersey. Chances are, your internet research will lead you beyond the Delaware River to the Poconos, which turn out to be in Pennsylvania. As it happened, they were right on the way to a family gathering we were having at ancestral grounds further west. Rentable canoes for whitewater apparently no longer exist, but Blue Mountain Sports offers a ten mile do-it-yourself kayak trip through some easier rapids on the Lehigh River, starting at the town of Jim Thorpe. The rapids were a perfect introduction for my daughter, who quickly figured out how to follow the current and steer clear of the rocks. Meanwhile, Dad was getting distracted by the native plant diversity flourishing along river's edge. Conducting plant inventories while negotiating rapids may prove to be the next new fad in extreme botany. Cardinal flower (red) and JoePyeWeed (pink) grew thick along the shore, mixed with a host of other familiar native species that sometimes made me feel like I was kayaking through my backyard. Causing some worry were a few sightings of Japanese knotweed, an exotic species that can replace native diversity with a monoculture over time. Here, a cardinal flower is trying to hold on at the edge of an expanding Japanese knotweed clone. A several-acre field of solid J. knotweed seen on the way in to Jim Thorpe foretells what could happen to this beautiful river corridor if no preemptive action is taken to nip knotweed's invasion in the bud. Later on, camping at Mauch Chunk State Park, the lakeshore offered still more familiar wetland garden species. Here's deer tongue grass, which in Princeton is numerous along the towpath. Pickerelweed blooms all summer long just out from the shoreline, thriving in the stable water regime of the park's impoundment. The next day, after making a note to research better pads for sleeping in a tent, it was back to the Lehigh River for a hike up a narrow valley to the Glen Onoko Falls. The trail is unmaintained, and described as steep and dangerous. On a dry day, and exercising some care, the hike was easily doable. We had almost as much fun going up as the water clearly was having cascading down the hillside. For a picnic at the top, the view provides the main sustenance. 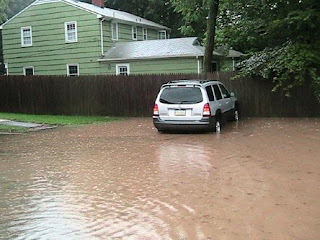 Heavy rains in late August can cause major mischief in Princeton, with many people gone on vacation and a lot of basements left unwatched. This is a good time to recall someone who's out of town, and consider contacting them to ask if their basement is prone to flooding. 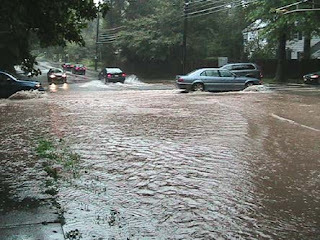 Typically, the worst flooding happens during the last of a series of downpours, after the ground has already become saturated from previous rains. For my part, as the last downpour was easing up at dusk, I headed out across flooded streets to the high school ecolab wetland, where past overwhelmings of the stormdrains had caused water on Walnut Street to flow under the back doorway into the performing arts center, ruining the stage floor. Since that fiasco, the school has sandbagged the doorway during heavy rains. But in late August, it's quite possible that the staff who know about the sandbagging procedure are on vacation. which was filled to the brim with water from nearby roofs, parking lots and streets. It's supposed to fill up like that; the design flaw is in the overflow, which sends extra water not out into the street but instead towards the school. The hallway of the performing arts center looked a little wet. I slogged home, called the borough police and asked them to have someone at the school check for flooding indoors. Of course, it would be nice if product recalls could include flood-prone buildings and basements. Simply send them all back to the original builders for a redesigned version. and, on higher ground, blackhaw viburnum. When this neighbor's white pine started turning brown, I was secretly pleased. Growing to the south of my house, it had started to block out the sun's warmth in the winter. I had hoped the neighbor would take it down, to save the fig tree underneath it, and to give growing room to a nearby red oak. He had said he would, but didn't. Usually such an impasse continues for years, given the power of procrastination, but this year my wish came true in an unexpected way. The tree simply died. 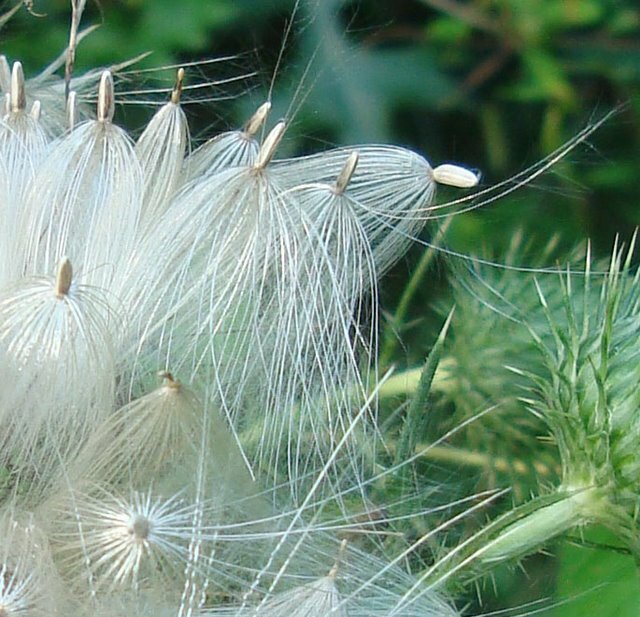 Lest I think there be power in a wish, a recent email from former Princeton Environmental Commission member Grace Sinden implicated the herbicide Imprelis, manufactured by DuPont and approved last year by the EPA. It's used only by landscape professionals. Several other white pines around town have turned brown recently, though there's no definitive word on cause. Cicadas "Clean up real good"
This fellow was found crawling across the front walk, still bearing evidence of its long stint underground. Seeking a mate, a shower might be timely, but given the lack of facilities, the cicada has come up with a far better strategy. It climbs up to a good perch, sheds its old skin in the privacy of darkness, and pumps blood into newly unfolding wings. The underside of a tree limb works well, since there's no obstruction that could rub against and bend the delicate wings as they take shape. My daughter discovered lots of these shed skins still attached under the limbs of a red oak. Some cicadas don't bother climbing a tree. This one latched on to the petal of a coneflower in preparation for moulting. and cutleaf coneflower. Off the towpath, DR Canal State Park staff have mowed a path through the expanse of wildflowers under spreading oaks. Raindate, if needed, is Sunday morning, same time. Check this website for any last minute weather-related change.